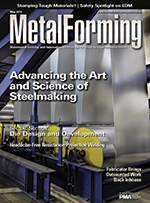 ...have metalformers searching for shaping and joining solutions. Have no fearVersion 5.0 of the 400-plus page AHSS Application Guidelines is here, 5 yr. in the waiting, and it's chock full of answers to your forming and joining questions. In this game, the object is to save money while delivering a formable part through the right tooling. Die-design and simulation software can deliver the win. Leverage the numerous advantages of servo-press technology to stamp high-strength steels and aluminum alloys. Flexibility, speed, accuracy and energy efficiency to bootthis Illinois OEM upgrades its inhouse metal-fabrication capabilities on the backs of new servo-electric punching and bending equipment. Follow the advice offered here to successfully projection-weld nuts and studs and avoid cold welds and thread distortion. New abrasive technology delivers automated deburring and surface finishing in a single operation.